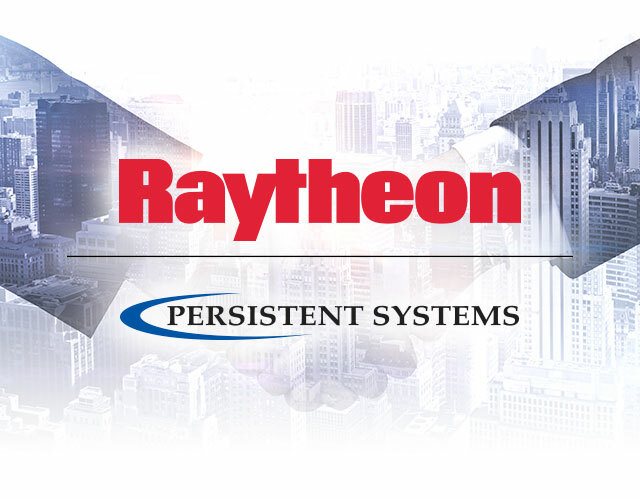 NEW YORK, N.Y.— Persistent Systems, LLC (“Persistent”) announced today that it has entered into a five-year partnership with Raytheon Company (NYSE: RTN). Raytheon will incorporate Persistent’s Wave Relay® MANET technology into Raytheon’s family of manned and unmanned systems and sensors, creating a true battlefield network. Persistent is proud to have been selected as Raytheon’s MANET communication solution out of the many commercially available MANET solutions. “Over the next 5 years, the battlefield will experience a transformational infusion of autonomy, collaborative behaviors, swarming, and artificial intelligence. A scalable, dynamic, peer-to-peer communication system with edge computing will provide the foundation on which these technologies will be built,” said John Hobday, of Raytheon Advanced Concepts. Integration has already begun across a number of Raytheon platforms. Persistent’s Embedded Module is easy to integrate and provides tremendous capability, enabling Raytheon to accelerate their development efforts and to bring cutting-edge products to market faster. Headquartered in New York City since 2007, Persistent Systems, LLC is a global communications technology company that develops, manufactures, and integrates a patented and secure Mobile Ad Hoc Networking (MANET) system: Wave Relay®. The company’s industry leading R&D team has designed wireless networking protocols to support the cutting-edge Wave Relay® system and technology. Wave Relay® transmits and receives data, video, voice and other applications under the most difficult and unpredictable conditions. Their suite of products is field proven and utilized in Commercial, Military, Government, Industrial, Agriculture, Robotics, and Unmanned System markets. Please visit http://www.persistentsystems.com to learn more. Follow Persistent Systems on Twitter to get updates on the latest developments @pswaverelay. Company, with 2017 sales of $25 billion and 64,000 employees, is a technology and innovation leader specializing in defense, civil government and cybersecurity solutions. With a history of innovation spanning 96 years, Raytheon provides state-of-the-art electronics, mission systems integration, C5ITM products and services, sensing, effects, and mission support for customers in more than 80 countries. Raytheon is headquartered in Waltham, Mass. Follow us on Twitter.